On the evening of June 25, local time, Chinese Premier Wen Jiabao arrived in Birmingham by special plane, kicking off an official visit to Britain. In a written speech delivered at the airport of this British city, Wen said that since the establishment of diplomatic relations 39 years ago, bilateral relations have traversed through an extraordinary course and the two countries have now forged a comprehensive strategic partnership and an all-dimensional cooperation pattern. The past decades saw both countries carry out frequent high-level contacts, harvest rich fruits in various cooperation fields, coordinate closely in global and regional affairs and bring tangible benefits to their peoples, he said. Under the current complex circumstances on the world stage, Wen added, further enhancing communication and cooperation between China and Britain is beneficial not only to the two countries themselves but to the whole world. The premier said that his current visit is aimed at promoting communication, cooperation and development and that he looks forward to exchanging in-depth views with British Prime Minister David Cameron on bilateral pragmatic cooperation and other issues of common interest. Wen added that he is confident that with the joint efforts of both sides, his visit will be a great success and will inject new energy into the continuous, steady and healthy development of bilateral relations in the 2nd decade of the 21st century. Senior officials from the British government, Chinese Ambassador to Britain Liu Xiaoming and other officials greeted Wen at the airport. 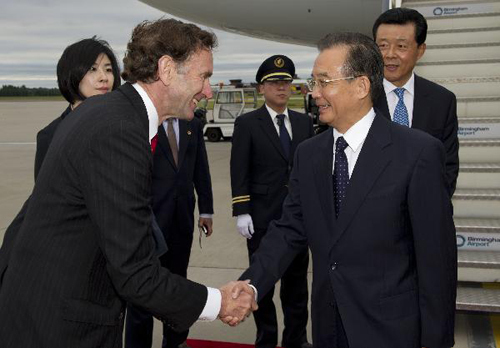 Premier Wen arrived in Britain after concluding his official visit to Hungary. Senior officials from the Hungarian government and Chinese Ambassador to Hungary Gao Jian saw Wen off at the airport upon his departure from the Hungarian capital of Budapest.